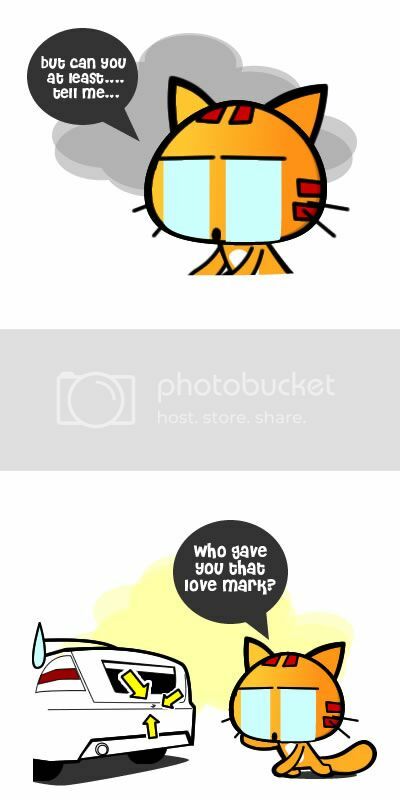 Miao & WafuPafu Comic Blog » Miao’s Wife Cheated on him. « Present Wrapping is hard. Miao’s Wife Cheated on him. Sob sob…I found a love mark on my wife’s rear bumper. The mark was quite deep with the paint coating coming off and exposing the inner black plastic part. Couldn’t do anything about it, spraying the whole bumper isn’t a good idea either. Posted on December 22, 2009 by Jian Akiraceo. This entry was posted in Rant and tagged car scratch, cheating, love marks. Bookmark the permalink. HAhha paint it with fabric paint! Hie Miao, I have the same incident, someone scratched on my 2 months old car. The scratch is about 4 inches long and the paint coating came off also. I told myself that people just jealous on the car I am driving, I forgive the guy who did that on my car. mine just half inch long. Hahaha… Send it to paint shop. One day can finish paint and dry already. But prepare around RM200 to RM300. put a plaster then can liao…. Try to get the paint from those DIY shop and patch it yourself. Then use fine sand paper to smoothen the patching paint. Polish with those car polish for scratch. Try and see, the paint might not be as good as new, but it wouldn’t be so ugly, and it’s economic if you do it your self. Send to paint shop for patching also can, wouldn’t cost much, around 100 or less than that. Hahahaha! XD I bet she got it on with a hot smezy black Jaguar. Hehehe!! 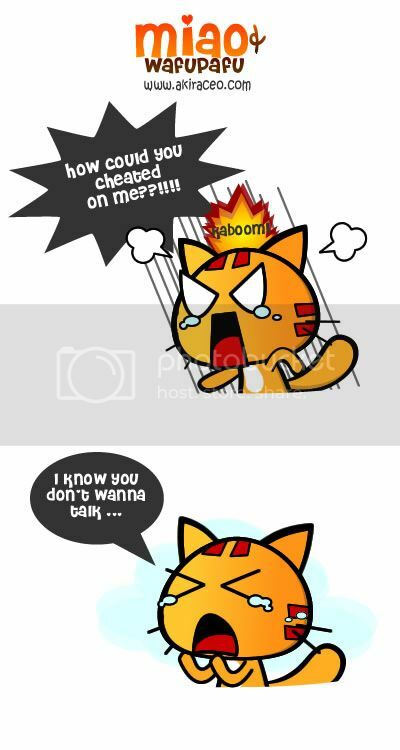 Aiyo miao you want your wife to talk, she also has no mouth to talk! XD Women are very secretive animals you know! mebi because you’re cheating oso? and ur wife knew about it? ahahaha..
Opps I mean.. I didn’t cheat! !